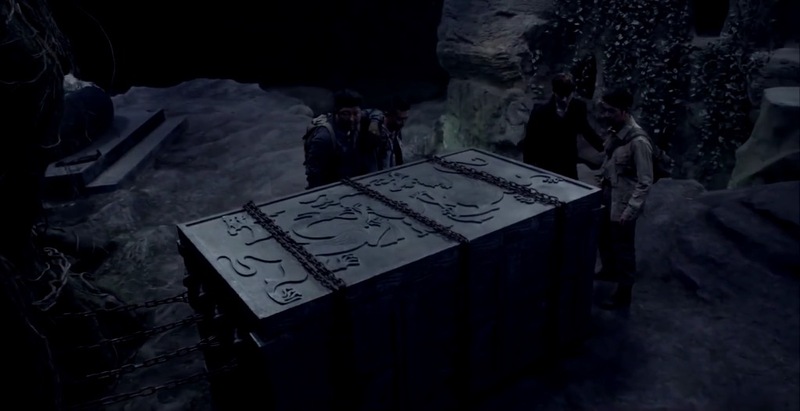 There’s suspension of disbelief, and then there’s The Lost Tomb. This drama is shaping up to be one of the most nonsensical things I’ve ever watched. Ugh. They gotta turn things around real fast in the second half of the drama for me to consider tuning in for season 2. At this point, I’m pretty much over it. I’ll watch the rest of the season, of course, but it probably won’t be very fun. Why you gotta disappoint me like this, drama?! Uncle Three points out to Wu Xie that Pang Zi doesn’t have a shadow. On top of that, he already saw Pang Zi’s corpse lying in one of the tomb’s tunnels. What…?! 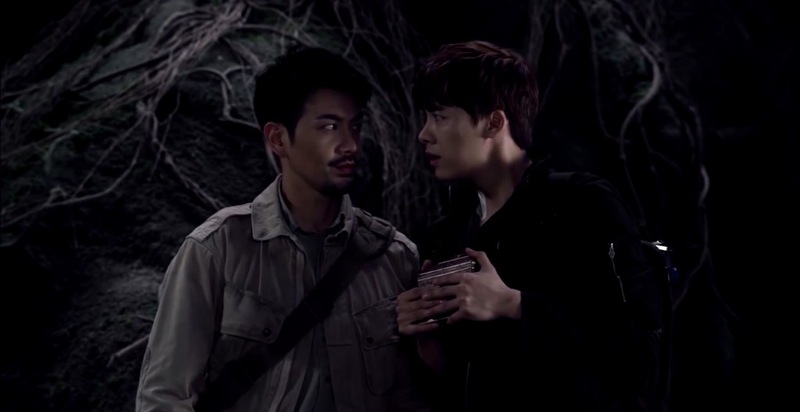 While all this secret whispering is going on, “ghost” Pang Zi is declaring his undying love to the female corpse. All of a sudden, he makes a move to attack Uncle Three and Wu Xie! He gets Uncle Three in a chokehold, but Xiao Ge quickly decapitates the male corpse and Pang Zi reverts back to himself. Xiao Ge declares that he was under the spell of the green-eyed fox. WTF IS GOING ON?!? Shh…you didn’t hear it from me. The so called green-eyed fox is the very male corpse whose head Xiao Ge just oh so casually chopped off. Uncle Three tells ’em that the fox is a human, but his father did a lot of evil crap so his son was born with green eyes and the face of a fox. Okay, that explains nothing. Thx for nothing…per usual. 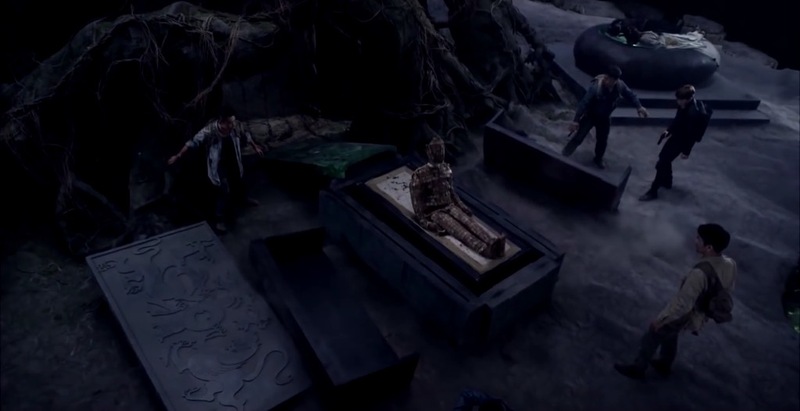 No time to dwell on the fact that Pang Zi was just possessed because Wu Xie is impatient and wants to open the locked box that the corpses were holding. He decides against it though when he realizes that it might be booby-trapped. Before the gang can continue walking around in more circles, the zombie is back. Ugh, seriously? While Pang Zi is diligently trying to fight him off, Ah Ning recognizes the zombie as one of her friends who went into the tomb with her. Xiao Ge steps in to put an end to the zombie, but Ah Ning recklessly jumps in. Seeing all the cool kids doing it, Wu Xie jumps into the fight too, but almost immediately gets slapped away, literally, by the zombie. Womp. Despite Ah Ning’s attempts to appeal to her friend’s human side, he’s just full-on zombie now. Once again, it’s up to Xiao Ge to save the day. 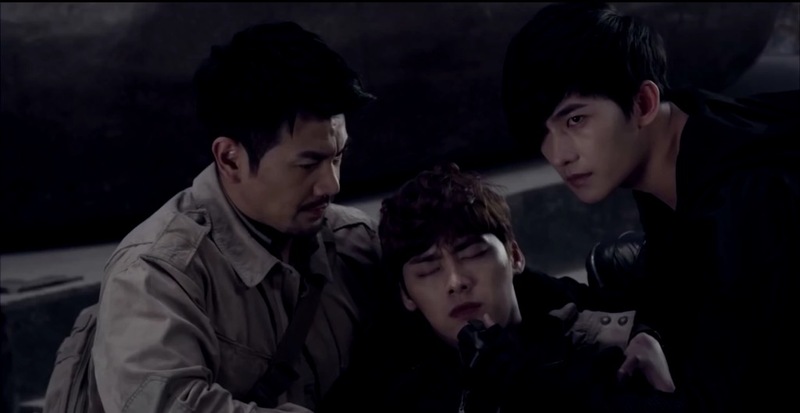 Wu Xie gets in the way of things (of course), and the zombie is choking the life out of him. When it looked like Wu Xie was for sure a goner, Ah Ning fires a couple of shots at the zombie to kill it. Was this supposed to be sad? Meh…no. Wu Xie is really confirming his status as the group’s burden when he passes out AGAIN from the zombie’s “poisonous touch.” Xiao Ge somehow knew that there was some herbal medicine/root thing with the corpses that can be used revive Wu Xie. But before he can feed him it, Ah Ning holds Pan Zi hostage and demands that he give her the medicine. Xiao Ge makes her a deal that Wu Xie gets the medicine, but he help her find and save her other comrades. Seriously, Wu Xie. This again?! While Xiao Ge is off on his own to find Ah Ning’s people, the rest of them are still just chilling. Looks like the only way outta there now is to climb up the giant tree. 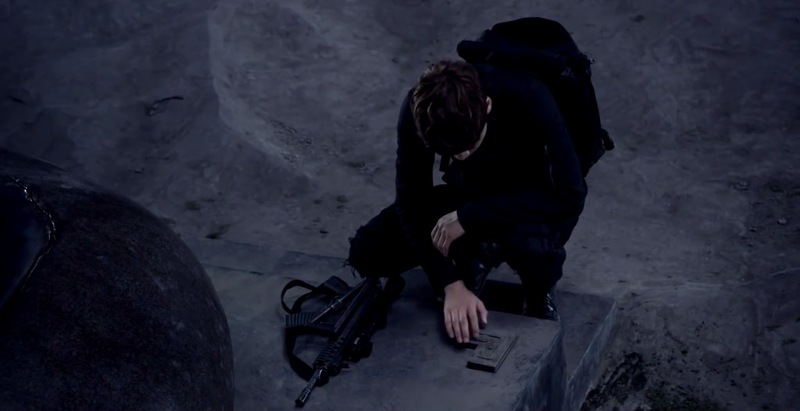 But of course, Wu Xie gets distracted by some lever button thing near the base of the tree. When he presses it, however, nothing seems to happen. But hold up! A few seconds later, the whole place starts shaking, earthquake style. When that’s all done, they see that yet another casket has emerged from underneath the tree. According to the ancient script on the casket, this is indeed the one that houses the infamous Lu Shang Wang, the lord who could summon dead spirits. Based on the way the chains are so tightly bound to it, Wu Xie thinks that they were used to keep whatever or whoever inside from coming out. Creepy. And when Uncle Three pulls on one of the chains, all these weird monster breathing sounds come out from inside the casket. Wtfff. Uncle Three must seriously be having a midlife crisis when he suggests that they open it up to take a look. Um, how about NO. 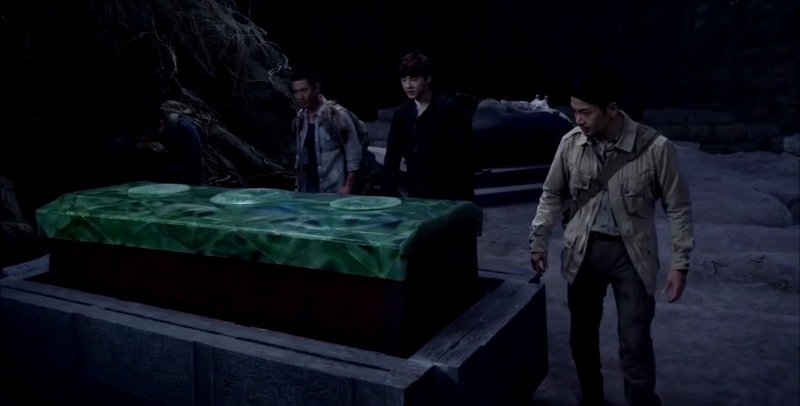 Even Wu Xie thinks it’s a super bad idea to open the casket, but his uncle insists on ruining everyone’s lives. Pang Zi apparently drank the Uncle Three kool-aid when he agrees that they open it. 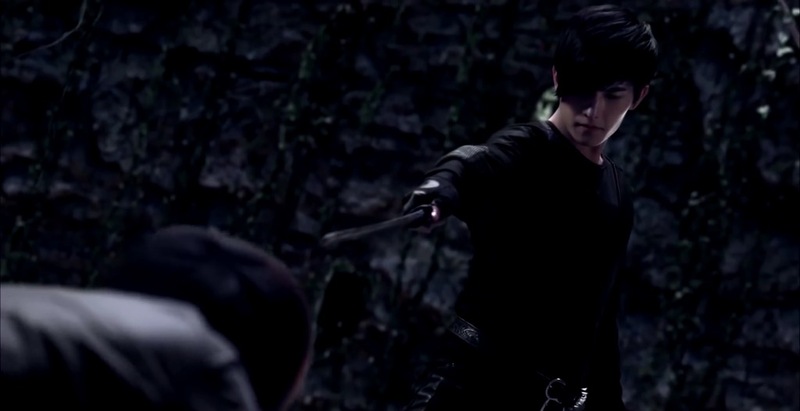 Outnumbered by the three middle-aged dudes, Wu Xie has no choice but to go with the crazy stupid plan. Demonstrating his incredible strength once again, Pang Zi manages to push aside the huge slab of stone all by himself. But inside, there’s another level to the casket where the cover this time around is made out of solid jade. Baller! After Pang Zi pushes aside the jade cover, they’re finally face to face with Lu Shang Wang’s casket…and there are breathing sounds comin’ outta it! Pang Zi finds the switch to open it. When the casket slides apart, up pops the corpse! JK, it looks like C3PO’s bootleg cousin. The rusty metal on it actually turns out to be some mythical jade that has never been seen in real life before. Uncle Three literally got $ signs in his eyes. The three middle-aged dudes are legit thirsty over this jade, and trying to remove it from the body. All of a sudden, Ah Ning pulls out her gun and tells them to freeze. When Wu Xie asks her what’s wrong, she tells them the body is breathing. Oh boyyy. 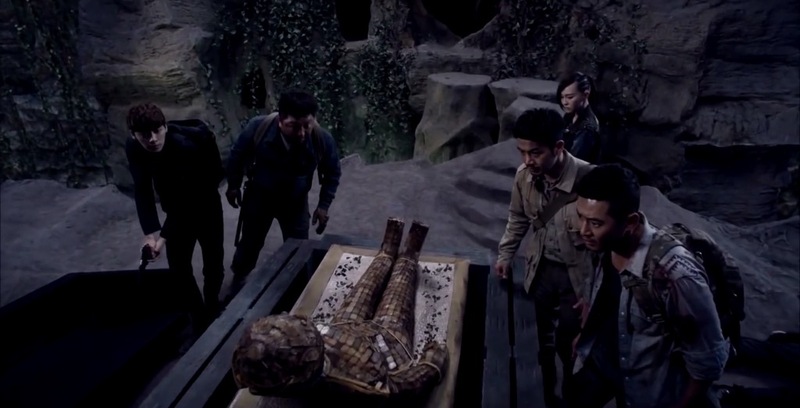 The bad guys aka Ah Ning’s buddies tell High Shao and Cheng Cheng that they aren’t after the treasures in the tomb. I don’t know why they made Wu Xie so… tofu-like in the drama, lol. Sure, he was pretty much a noob in his first tomb raiding even in the book, but what he did at least, wasn’t to create more trouble when he couldn’t offer any help, hah!